Worms – OurWorms, the fundament of the business, are “red wigglers” (Eisenia foetida or Eisenia andrei) and are sold in 1 lb., 1/2 lb., or 1/4 lb. increments. For special orders, larger packages of worms can be arranged. The worms are packed in an appropriate growing medium (coconut coir) in stackable, breathable containers. A lot of people ask us how many red wiggler worms they should buy. (The smallest amount we sell is 1/4 lb. at $11 plus NC sales tax.) It depends on how fast you want to get your worm bin working at maximum capacity. A fully populated worm bin working at maximum capacity has approximately 2 lbs. of worms per square foot. So if your bin is 2’×2′ square (= 4 square feet total) you should ultimately have 8 lbs. of worms in that space. Another fact to remember is that, under ideal conditions of moisture and worm food (a very tricky balance that we can help you achieve), a worm population will double about every three months. So, if you purchase 1/4 lb. of worms it will take more than 1 year to fully populate your 2’×2′ bin. I.e., your original 1/4 lb. will grow to 1/2 lb. in 3 months, 1 lb. in 6 months, 2 lbs. in 9 months, 4 lbs. in 12 months, and 8 lbs. in 15 months. OurWorms are available at our Sales Venues at Farmers’ Markets. However, availability of worms is not always a sure thing, so make sure you call, text or email first before travelling to our sales venues. 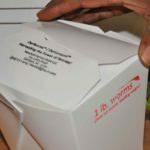 Since packaged worms are extremely vulnerable to being overheated and other environmental stresses, they must be refrigerated at all times prior to being let loose in worm barrels, compost bins, and gardens. But don’t keep them refrigerated for too long either! They should not be kept in the refrigerator for more than three days, and only in the front of the upper shelf of your refrigerator (the warmest place in your refrigerator). Many refrigerators are set low enough to freeze OurWorms. 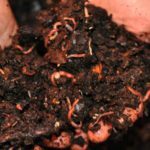 Worms come with instructions for proper care and use and how to best introduce them to a worm bin or barrel.